Doug’s Online Journal » Archives » Photo Print Sales Website! 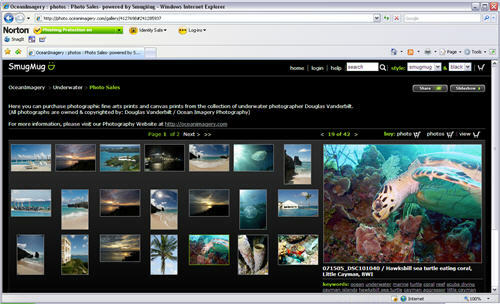 I have just finished setting up a new online account with ‘Smugmug’ to host and sell my underwater/travel photography. At the moment, I only have one collection of images uploaded, but for the future, I will be uploading new collections from some of the weddings and other events I have photographed. In the past I have had to jump thru some serious hoops in order to fill print orders… with the new print sales account, all that is taken care of online and in house at Smugmug. You can choose which photos you want to purchase; what sizes you would like them printed and you even have a choice of what the images are printed on (matte/glossy or canvas). All this is done with the ease of a shopping cart system and then the order is filled by Smugmug, where their professional print lab reproduces my photographs in the size requested. They then inspect the final prints for quality, package them and ship them straight to you. How easy is that! !